Pathologists’ evaluation of biopsies is an essential component of both the diagnosis of eosinophilic gastrointestinal disorders (EGIDs), and of the evaluation for response to therapy. Pathology reports communicate pathology diagnoses based on review of the slides made from GI biopsies. The communication between pathologists and gastroenterologists may be supplemented by discussions at conferences, phone calls and emails. All pathology reports display the pathologist’s final diagnosis; a description—called gross description—of the number and size of the biopsy pieces from each part of the GI tract that were submitted to the pathology lab; and in some a microscopic description of the features of the tissue on the slides made from the biopsies. High power field: Pathologists see patterns in every biopsy. Pattern recognition is essential for proper biopsy interpretation. Therefore, pathologists initially evaluate slides under the microscope from afar to determine the number of pieces of tissue that are on the slide, the pattern among the pieces, within each piece, etc. This degree of magnification is referred to as low power, and the circular area, or field, seen by the pathologist is referred to as a low power field. In order to view more detail in the tissue, pathologists use a different objective lens on the microscope and see less of the total area on the slide, but greater detail of the smaller amount of tissue that is in the field they see. This is referred to as high power magnification and the circular area subtended on the slide is a high power field. Typically high power fields have a standard total magnification of 400X, although the actual area of the field varies among microscopes. Peak count: This is the number of eosinophils contained within one high power field. Another means to quantitate eosinophils in biopsies is to count eosinophils in all the high power fields of all the pieces to generate a mean or average count, but that is not practical for daily work and is essentially a research tool. Pathologists survey the biopsy pieces at low power magnification, identify the area with the densest inflammation, and generate a peak eosinophil count by counting eosinophils in that area. In esophageal biopsies, only eosinophils in the epithelium are counted. Epithelium: Epithelium lines the inner surface of the tube that is the GI tract. Gastroenterologists see the epithelium during endoscopy but cannot distinguish individual epithelial cells. Epithelial cells participate in multiple processes, including a barrier function that prevents bacteria and undigested food or foreign material from entering the body. The epithelium that lines the surface of the GI tract is called surface epithelium. In the stomach and small and large intestines there are numerous invaginations from the surface that are lined by epithelial cells. In the stomach the invaginations are glands and the epithelium lining the glands is glandular epithelium. In the small and large intestines the invaginations form crypts and the epithelium lining the crypts is known as crypt epithelium. 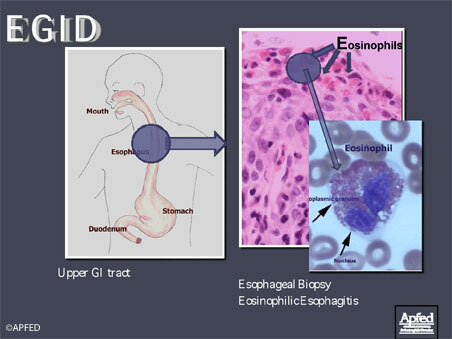 Basal layer: The epithelial lining of the esophagus is different from that of the rest of the GI tract. The epithelium of the esophagus consists of several layers but the surface and crypt epithelium in the rest of the GI tract mostly consists of one layer of cells. The esophagus is lined by squamous epithelium that resembles the lining of the mouth and also skin. 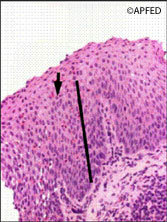 The basal layer of the esophageal squamous epithelium becomes thickened in EoE, described as basal layer hyperplasia. This is a reactive and reversible change. Normal esophagus: This is normal esophageal squamous epithelium. The arrow points to the basal layer, and the bar designates the maximum thickness of the basal layer in this biopsy. This is a biopsy from the esophagus from a patient with eosinophilic esophagitis. The bar designates the thickness of the basal layer, which is markedly increased compared to the thickness in a normal biopsy. The arrow points to one of numerous intraepithelial eosinophils. Lamina propria: This is composed of fibrous tissue, blood vessels, and other types of tissue that provide structural support and perform other functions for the surrounding tissue. Since the configuration of epithelium is different in the esophagus from the rest of the GI tract, the configuration of the lamina propria is also. In the esophagus, it forms a distinct layer below or outside of the basal layer of the epithelium. 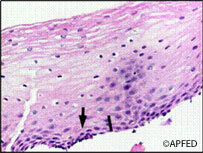 The lamina propria forms periodic protrusions into the epithelium called papillae that also contain blood vessels that supply oxygen to the epithelium. In the rest of the GI tract, the lamina propria resides immediately below the single layer of surface epithelium and surrounds the crypts. The differing configurations of epithelium and distribution of lamina propria explains the fact that lamina propria is not present in some, or most, esophageal biopsies but is virtually always present in biopsies from the rest of the GI tract. Parietal cells: These are specialized epithelial cells found in stomach glands that secrete acid. Anti-reflux medications block acid secretion and in response these cells become enlarged and numerous, a finding that pathologists report as reactive change consistent with the use of PPIs, or parietal cell hypertrophy and hyperplasia. Villi: These are protrusions of the surface into the lumen of the small intestine and normally are found only in small intestine. All parts of the small intestine have these, but villi vary in length and width somewhat among duodenum, jejunum and ileum. Villi enormously increase the surface of the small intestine, increasing the area over which nutrients derived from food can be absorbed. Villi may become altered in numerous diseases. The most common alteration is blunting or a decrease in length, which is found in celiac disease but may also be seen with excessive numbers of eosinophils. Muscularis mucosa: This is a layer of muscle that separates the mucosa from the underlying submucosa. It may be present in biopsies from the GI tract depending on how deeply the biopsies were obtained. It is rarely seen in biopsies from the esophagus, but is more commonly present in biopsies from the rest of the GI tract. One criterion for making a histologic diagnosis of EGIDS in sites other than the esophagus is finding eosinophils in the muscularis mucosa. Submucosa: This layer of the wall of the GI tract is below the muscularis mucosa and contains blood vessels and other structures. If any submucosa is seen in GI biopsies, it generally is only a small amount. Eosinophilic inflammation in the submucosa is also used as a criterion to help to diagnose EGIDS. Bone marrow biopsy in Hypereosinophilic Syndrome, exhibiting a markedly increased number of eosinophils. This may happen with a number of disorders, including parasitic infection or Hypereosinophilic syndrome. Should Pathologists count the eosinophils? Yes: The diagnosis requires the presence of eosinophils, and in a relatively large quantity. The pathologist must provide the information that at least one high power field contains at least 15 intraepithelial eosinophils for diagnosis. It is preferable for pathologists to provide an actual count, and not simply that there are more than 15 eosinophils in at least one high power field. The degree of reduction of inflammation becomes easier to comprehend following therapy if the peak count after therapy is compared to the peak count prior to therapy. Also, lack of improvement, or even increased inflammation, after therapy provides a basis for changing therapy. The other changes frequently seen with numerous eosinophils are not specific and may be found in biopsies without eosinophils and therefore cannot be substituted for a peak eosinophil count. The histologic features must be interpreted in the clinical context: some patients who have numerous intraepithelial eosinophils have PPI-responsive disease, and rarely patients who have fewer than 15 eosinophils/hpf respond to EoE therapy. Fact: There is a poor correlation between the degree of inflammation and what the patient feels (e.g., pain or difficulty swallowing). The number does not determine the cause of the esophagitis, nor does it suggest one particular treatment over another. Fact: The reality is that eosinophils are easy to see on biopsy specimens processed in standard fashion in all pathology departments. “Eosinophilic” literally means “eosin-loving,” and they are named that because they take up a stain called eosin more than other cells. All biopsy specimens are stained with 2 stains, hematoxylin and eosin (referred to commonly as H & E), because unstained tissue on a slide is virtually impossible to see . Various tissue and cells take up the hematoxylin (which is dark blue) or eosin (which is red) in unique patterns predictably, which then allows the pathologist to identify the cell types in the specimen. 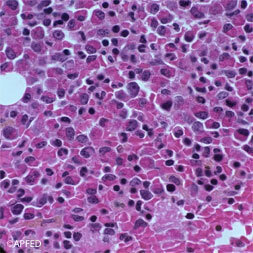 Eosinophils stand out from surrounding tissue because the granules within them stain intensely red with eosin. Furuta GT, Liacouras CA, Collins MH, Gupta SK, Justinich C, Putnam PE, Bonis P, Hassall E, Straumann A, Rothenberg ME: Eosinophilic Esophagitis in Children and Adults: A Systematic Review and Consensus Recommendations for Diagnosis and Treatment. Sponsored by the American Gastroenterological Association (AGA) Institute and North American Society of Pediatric Gastroenterology, Hepatology, and Nutrition. Gastroenterology 133(4):1342-63, 2007.